Ministry of Propaganda - 21/Jan/2007: "Short Sunday Walk: Uffington and Wayland's Smithy"
After two lazy weekends without a walk since my New Year Pub Walk it was time to start stretching my legs again. I didn't want to drive too far, yet wanted to see something I hadn't seen before. Looking through my Rough Guide to England I found the Uffington White Horse (where I had been before) and more importantly Wayland's Smithy (which I hadn't seen yet). Decision made. A short drive along the B4507 took me to the car park at White Horse Hill from where I set out for my short walk. I first walked towards the Uffington White Horse to see if I could get a nice view. Unfortunately some clouds passed through at that time, so the views weren't too good. 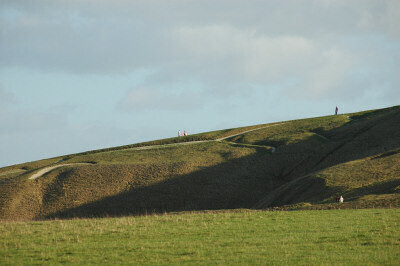 From the White Horse I walked up to Uffington Castle at the top of the hill. 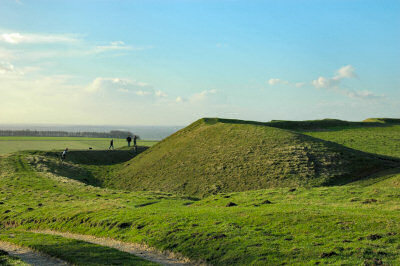 A fierce wind was blowing up here, the Iron Age earth walls not providing much shelter. I didn't stay too long before moving on. I joined the Ridgeway to walk south west for about a mile or so. After a while I arrived at Wayland's Smithy, a 5000-year-old Neolithic burial site. It is not really possible to enter the burial chamber, so I just had a quick look around the mound and the stones at the entrance. The afternoon sun provided some nice light until some clouds started to move in again. 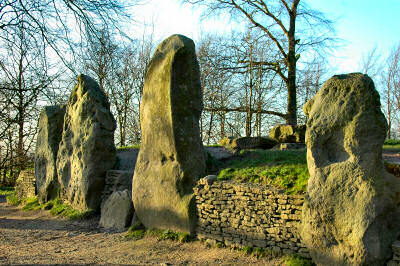 From Wayland's Smithy I returned to my car and drove back home, a quite nice afternoon was over. Next weekend I hope to go on a longer walk with the days getting longer again. The rest of the afternoon was spent with some baking (I made blueberry muffins using a recipe from Claire Macdonald's Scotland: The Best of Scottish Food and Drink) and preparing for the coming week.